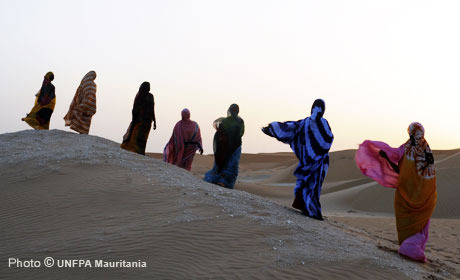 Active in Mauritania since 1979, UNFPA works to increase the quality of and access to reproductive health services, and to integrate population issues into national strategies. Programmes support the Government to promote gender equality and to develop national strategies on youth and reproductive health, as well as a roadmap for the reduction of maternal mortality. UNFPA assistance helps increase capacities to address obstetric fistula, prevent HIV, and produce quality demographic data. It is also actively contributing to integrating sexual and reproductive health in humanitarian crisis responses.